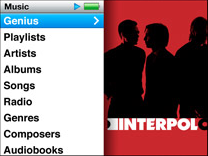 Apple representatives at the event yesterday told us, however, that a free software upgrade will be adding the Genius feature to existing iPod classics. While only the iPod Classics are specifically mentioned, we would expect that the previous iPod Nanos would also get a similar update. Genius playlists were introduced yesterday and provide a Pandora-like music recommendation system where similar songs in your library are grouped automatically in a playlist. Update: Cnet.co.uk has retracted their claim after being contacted by Apple. A previous version of this article suggested Apple would be making a free update for the original iPod classic that would add Genius functionality. Apple gave us a call, and apparently an Apple representative at the event the other day wasn't as much of an expert as we'd hoped. Apparently there aren't plans to offer a free Genius-enabling update to the original iPod classic. This was, by the way, the same rep who told us high-definition iTunes downloads would be supported by the new iPod classic -- something that turned out to be only vaguely accurate.